Another Jersey summertime heat wave is in the forecast - Monday will be the nicest day of the week, while Thursday will be the most oppressive. As I mentioned late last week, this weekend featured gorgeous "something for everyone" weather. Saturday was certainly hot and humid. (Apparently some really love that kind of summertime humidity, but not me!) Sunday meanwhile, was warm and not-humid — simply beautiful. Back to work Monday looks to be the nicest day of the workweek, as warmer, more humid air knocks on our door. We may very well hit heat wave criteria for Tuesday, Wednesday, and Thursday. Monday morning has been lovely so far, with thermometers in the 50s across most of inland New Jersey. The coast is a bit warmer, mostly in the 60s in Monmouth and Ocean counties, with 70s along the waterfront in South Jersey. We'll enjoy mostly to partly sunny skies Monday, pushing high temperatures into the lower to mid 80s — probably a couple degrees warmer than Sunday. Humidity will steadily creep upward on a stiff southerly breeze. An isolated thunderstorm may form after about 3 p.m. Monday, but the vast majority of New Jersey will stay dry. A few showers and patchy fog will be possible Monday night. More importantly, however, it's going to feel quite muggy again. Stifling, even. Lows will only fall into the lower 70s by Tuesday morning. 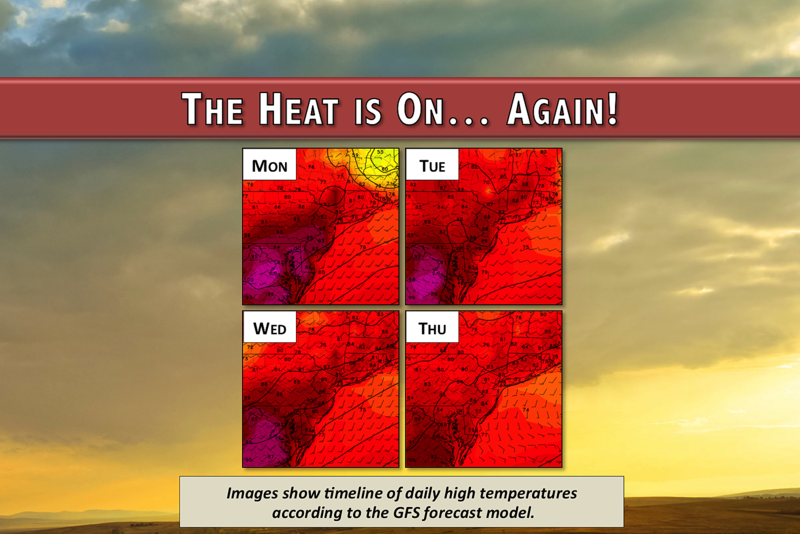 So it's back to heat and humidity on Tuesday, with widespread high temperatures in the upper 80s to around 90 degrees. Partly to mostly cloudy skies will accompany widely scattered showers. The day will be wetter (and potentially stormier) than Monday, but there will still be plenty of New Jersey locales that stay dry Tuesday. Temperatures will hold steady on Wednesday, with high temps around 90 degrees. Look for a mix of sun and clouds over head and, once again, we can't rule out a popup thunderstorm during the heat of the day. As I mentioned Thursday looks to be the hottest and most oppressive day of this particular heat wave. As statewide high temperatures climb into the lower 90s, the heat index (or "feels like" temperature) will peak near 100 degrees. (Yuck!) We'll probably be mostly cloudy for most of Thursday and there's a chance for a cooldown from scattered showers and thunderstorms. The GFS model paints a "best case scenario" for Friday, flipping winds to a northeasterly direction. Such an on-shore flow would cool us off a little bit, especially along the coast. My current forecast calls for high temperatures somewhere between the mid 70s and upper 80s. This is a fairly low confidence forecast for now, so I hope we'll get more resolution as the week presses on. As for the upcoming weekend? After all the heat, humidity, and unsettled (stormy) weather, I'm happy to say most of the weekend forecast looks good. Our current outlook calls for sunshine and mid 80s on Saturday. While Sunday will start with similar conditions, a late-day front would sweep showers and thunderstorms through the state.